Hindu , UNMARRIED, B-Tech, PG In Finance. 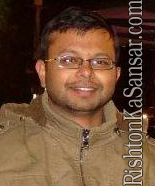 Father Occupation : Project Manager Up State Corporation Ltd. Ghaziabad. Mother Occupation : Director In Big Real Estate Firm Panchsheel Promoters Ltd Very Creative Lady And Attached To Family. Sister's Details : P G D M From Indian Institute Of Management Kashipur Research Infosys Labs B.Tech From Jss Noida.